Charming Hale 'O Bali (House of Bali) is perched on a one acre estate near her sister adjacent home, Java Kai(listing #388724). The homes are booked separately. Choose between Hale 'O Bali (1-4 persons) , Java Kai (1-6 persons), or book both and the entire one acre, private estate. The two homes can accommodate 1-10 persons. These oceanfront, AUTHENTIC, Indonesian hardwood homes are located just off the main shoreline highway in Kaneohe on the windward side of Oahu. We can host your wedding/reception, holiday, family gathering, celebration, event, or retreat. Charming, intimate ,Hale 'O Bali has 1 bedrm, 1 bath with an alternative sleeping loft above the master bedroom, for older children who would enjoy climbing the fixed ladder instead of staying in the den on the comfortable queen futon couch/bed. Enjoy the 1100 Sq. 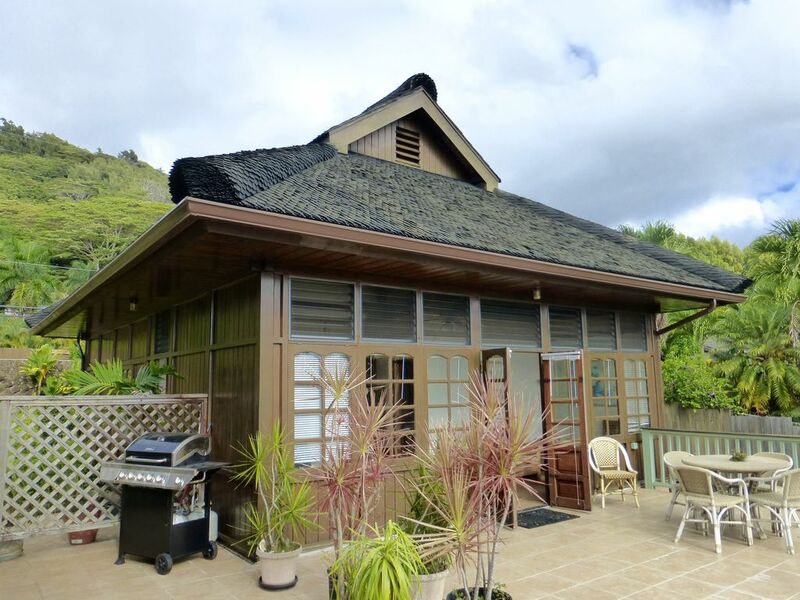 Ft. porcelain tiled deck Take in spectacular views of Kaneohe Bay and the Koolau mountains. The high open beam ceilings are graced with Woven Bamboo (Bedeg). Your feet will stay cool on the Ceramic Tiles throughout . Tradewinds and ceiling Fans in each room help keep you cool and comfortable. Enjoy the soothing sounds of the Waterfall from the Fish and Lily Pond just outside the west side of Hale 'O Bali . Hale 'O Bali is equipped with a Full Kitchen with Granite Countertops and Mahogany Cabinets. Out on the large 1100 square foot porcelain tiled deck take in the Sunrise over the Ocean Horizon and Spectacular Panoramic Views of the Koolau Mountains, Chinaman's Hat Island, and the turquoise and emerald hues of Kaneohe Bay. Enjoy the lush, colorful, and fragrant gardens and Stroll the One Acre Property to the Shoreline, approximately 300 feet in length.. The great lawn and ocean garden are perfect for events and the 20' high lava rock privacey wall is a perfect backdrop for an event tent or space. The NONswimming beach here is beautiful, but is shallow for such a long way out and can be rocky also and so is not practical for swimming. The views of the bay and Koolau mountains and Chinaman's Hat Island are breathtaking from here. The waters here are very protected and lend themselves nicely to boating and paddleboarding. There is a white sandy beach 3 minutes drive away at Kualoa Beach Park. It is one of the ten top rated beaches on Oahu and has extremely safe and protected waters for all ages. Keywords: Bayfront ,Estate , one acre shoreline estate with two authentic Indonesian homes. I manage this family owned property. I currently reside on Kauai with my husband and daughter where I help take care of our farm. My mother and son also help care of Hale 'O Bali and making sure guests are comfortable and cared for! Our family shipped these Minahasa Island homes over from Sulawesi, Indonesia and rebuilt them with great difficulty. The area here is rural and a far contrast to the bustle of Honolulu. I personally lived in each of these homes over many years and have never loved living in any home more. The two homes are separate but share a very large rambling deck. Hale 'O Bali is the smaller of the two homes. The charming ambiance and warmth of this chempaca wood home is magical. Come enjoy the serenity, the views, and the unique Indonesian architecture! Directly on Kaneohe Bay. Water is calm and protected year round. Excellent for kayaking, stand up paddle boarding, but not practical for swimming. Waters are shallow for a very long way out. Spectacular views of ocean and Koolau Mountains. Property is located directly on the shoreline. Sunrises here are beautiful. located on Kaneohe Bay. Views are spectacular. Calm Protected waters year round. Shoreline is a bit rocky and silty. Very shallow so not practical for swimming. plenty of free parking. 2 car Parking inside gated compound. Ample parking on private road just outside the compound also. A few simple board games are available in the house. One acre lawn/garden stretches out to the shoreline. Large tiled deck faces the ocean and has outdoor dining table available. 3 inch elevation to deck and patio from parking. Bathrooms not big enough for wheelchair. Call to specify needs. Beautiful views and peaceful property. No frills, but everything was clean and comfortable! Snorkelling/Scuba Diving, Adventure tours, paintballing, horseback Trail Riding, Recreational 4-Wheeling are available at Kualoa Ranch which is a very close neighbor 3 miles north. Senator Fongs Plantation in Kahaluu, Hart and Tagami galleries in Kahaluu, Polynesian Cultural Center 20 minute north in Laie, Byodo Inn Japanese Buddhist Temple with gardens and Huge Koi ponds in Ahuimanu 7 minutes south, Golfing at Pali Golf Course in Kaneohe, or Turtle Bay Hilton about 35 minutes north in Kahuku.